The New York Times mentioned Mysore as a must-see place in its annual travel listings two years ago. The city, ruled by the Wadiyar kings until Independence, is hot on India's tourism circuit. Foreign tourists routinely camp here for months to learn yoga. The city, with little or no corporate presence, is seen as a pensioners' paradise. The nearest operational airport at Bangalore is a good four-hour drive away. Can a B-school in such a place, away from industry hubs, offer the best education and exposure to students? "Our founders chose Mysore not for a lack of choice, but seeing it as an ideal place to provide education," says N.R. Parasuraman, Director of Shri Dharmasthala Manjunatheshwara Institute for Management Development (SDMIMD). The name derives from Dharmasthala, a famous centre of worship in Karnataka, about 225 km from Mysore. The head of the temple, D.Veerendra Heggade, set up the B-school on a 10-acre plot at the scenic foothills of Chamundi in Mysore in 1994. For any B-school in a small city, the biggest challenges are attracting top-flight faculty and ensuring placements. SDMIMD has delivered on both counts, asserts Parasuraman. The faculty attrition has gradually come down to zero because of the academic environment on the campus, he says. For placements, the school is following a well thought out plan. 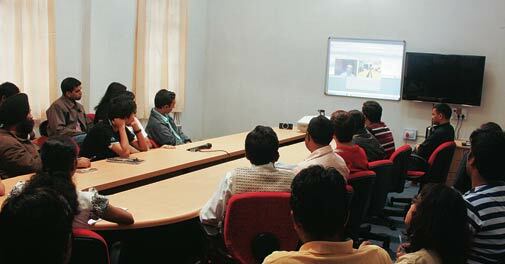 "The companies can interview our students either on the campus, or through video-conferencing, or even at Bangalore. There is a fourth option too. If a company requests, we send our students to its office, but that happens quite rarely," says Parasuraman. The strategy appears to have paid off. For the 2011/12 batch, 43 companies recruited from the school at an average annual salary of Rs 5.6 lakh. At a fee of Rs 8.4 lakh for a twoyear management programme, SDMIMD is not cheap. Yet it has students from all corners of the country - of the 180 students in the 2012/14 batch, 114 students are from 22 states, excluding Karnataka. "I chose this institute because we get singleroom accommodation here and the placements are 100 per cent," says Priya Batra from Bhopal. Most of the other prominent B-schools in smaller cities too have well crafted strategies in place to offer the best to their students. For example, the two new Indian Institutes of Management (IIMs) at Shillong in Meghalaya and Kashipur in Uttarkhand. Travelling to Shillong can be time consuming and arduous. The nearest metro is Kolkata, 1,100 km by road. Shillong has an airport but there are few direct flights - the nearest well connected airport being Guwahati, about 100 km away. But the four-year-old B-school has found a way around the problem of distance by using the web as a means of communication with faculty and the industry. The institute has quite successfully deployed open-source web conferencing tools and configured them to its requirements. Last year, visiting faculty S. Jagadish conducted 90 per cent of his classes on corporate information strategy at IIM Shillong using a slew of web tools, and kept his visits to the campus to a bare minimum. The institute also encourages corporates to use the facility for job interviews if they are not able to visit the campus. According to Merlvin Mukhim, corporate and public relations officer at the school last year around 30 of 93 students had job interviews through videoconferencing. Some more attended interviews at company offices. The initiatives, overall, have worked well. The 2011/12 batch was placed at an annual average salary of Rs 12 lakh. Basav Roychoudhury, professor of information systems, says the institute is now trying to encourage other colleges in the region to start using web tools as well for academic and other purposes. To retain faculty, the institute is offering other incentives as well. For instance, IIM Shillong has built contacts with some of the leading schools in the town to facilitate hassle-free admission for the children of faculty members. The year-old IIM at Kashipur in Uttarkhand can pick up a few useful lessons from Shillong. The town has its own odds. The nearest airport at Pantnagar is two hours away by road and, like Shillong, it is not well connected with the rest of the country. Delhi, the nearest metro, is about six hours by road or train. The school's present temporary location though is a nature lover's delight. It is surrounded by lush green fields of paddy and sugarcane. The Jim Corbett national park and Nainital are also nearby. The forests and hill stations will surely draw quality teachers, feels K N. Badhani, a faculty member. The director, Gautam Sinha, shows mails from three US-based professors expressing their willingness to shift to Kashipur. "The location does not matter much with technology fast evolving to make distances redundant. All the more so for a brand like IIM," says Sinha, who claims the institute is ahead of other B-schools in using latest technologies. "Our server is on Google Cloud." Sinha points out that Indian Institute of Technology, Kharagpur, is among the best engineering colleges in the country, though the town is in a remote corner. What holds immense hope for the B-school is the way the Rudrapur-Pantnagar-Kashipur corridor is shaping up as an industrial belt. The area already hosts some leading names such as Tata Motors, Ashok Leyland and Bajaj Auto. Meanwhile, a few companies have already promised to be part of IIM Kashipur's first placement season next year and about 899 teachers have applied for faculty positions. The institute is in the process of setting up its permanent campus nearby on a 200-acre plot. The B-schools in the small towns are expected to evolve into townships of their own. The government too deliberately chooses tier three towns to locate new IIMs so that they acAshok Leyland and Bajaj Auto. Meanwhile, a few companies have already promised to be part of IIM Kashipur's first placement season next year and about 899 teachers have applied for faculty positions. The institute is in the process of setting up its permanent campus nearby on a 200-acre plot. 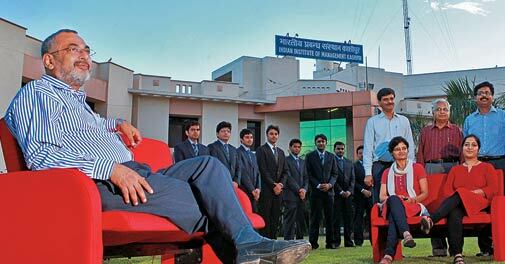 The B-schools in the small towns are expected to evolve into townships of their own. The government too deliberately chooses tier three towns to locate new IIMs so that they acquire distinctive identities and develop courses and curricula that are innovative and unique, says an official in the Human Resource Development Ministry.